Sparkling Gems. Opulent jewellery, elaborate sequin embroidery and iridescent lurex materials crown the winter holiday season. The new designer collections are extremely glamorous with “bejewelled” and lavishly decorated clothing. A festive, feminine make-up look is the ideal match for the unique fashion highlights. The Limited Edition “Treasure Trove” by CATRICE presents the most important beauty pieces for this style from mid November 2015 until the beginning of January 2016. The limited musthaves are matt or shimmering and greet us in elegant champagne-gold, warm brown and beige shades as well as contrasting apricot or red. The eye shadow palette with eight highly-pigmented eyeshadow colours, a golden powder with a glow and four nail polishes with a light pearl effect ensure an unforgettable festive season. Celebrate Good Times – by CATRICE. This colletcion also includes 3 amazing shades of lipsticks in Jewel Daze, Caviar And Champagne and Treasured Twinkles. They come in unique golden containrer with small golden stars engraved. They will retail around 4,29 €. Stay tuned if you want to see pictures of Jewel Daze!! And of course as in every collection there will be nail polish! 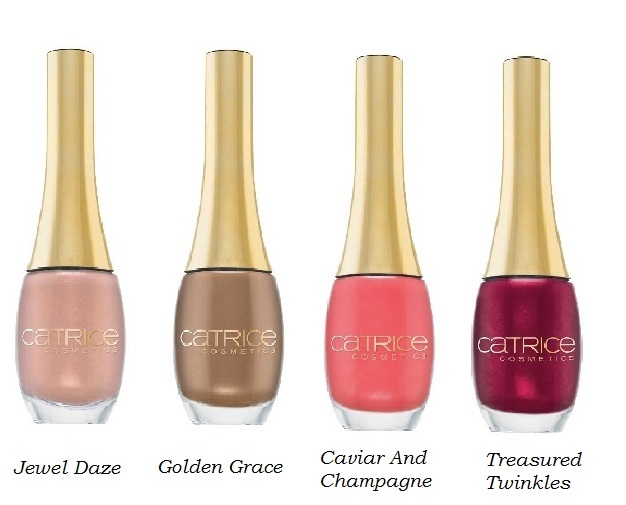 This collection will include 4 different shades of nail polish in glamorous bottles like never seen at Catrice. They will come in Jewel Daze, Golden Grace, Caviar And Champagne and Treasured Twinkles and retail at around 3,79 €. Do I see some shimmer in Treasured Twinkles? I really can't wait to see them in stores! I received lipstick in Jewel Daze from this collection from Slovenian distributor already and I can't wait to make a post with swatches (probably by the end of this week)! Stay tuned for swatches!